Creator Omate presented his latest gadget at the Mobile World Congress (February 27 to March 2). As reported by AndroidHeadlines, the O4VC (short for: "Omate 4G Video Call") is the company's first smartwatch, which supports the fast 4G connectivity and allows for easy video calling from the road. The colorful watches are aimed not only at technically savvy wearable fans, but also for children, elderly people and above all companies. According to a press release from the manufacturer, a Snapdragon 2100 from Qualcomm, which was presented a year ago on the MWC 2016, is working inside the O4VC. The smart Omate watch comes with a 1.3 inch square color display with a resolution of 240x240 pixels on the market. The Android model has 512 megabytes of RAM as well as 4 gigabytes of internal memory. The 600-millimeter-hour battery runs according to Omate specifications for three days, before it must at the socket. A 2-megapixel front camera, a built-in microphone and a loudspeaker enable the videotelephony with a 4G-LTE support via SIM card. The O4VC has the Bluetooth standard Low Energy 4.1, Wi-Fi 802.11 and GPS. German users could nevertheless get problems with the videotelefonie, because the 20, which is important for the domestic radio, the Omate Smartwatch is still missing. According to IP67 standard certification, the O4VC with its colorful plastic housing is resistant to water, dust, dirt and so suitable for a more robust handling. The manufacturer wants to expand his target group and also appeal to children and the elderly. 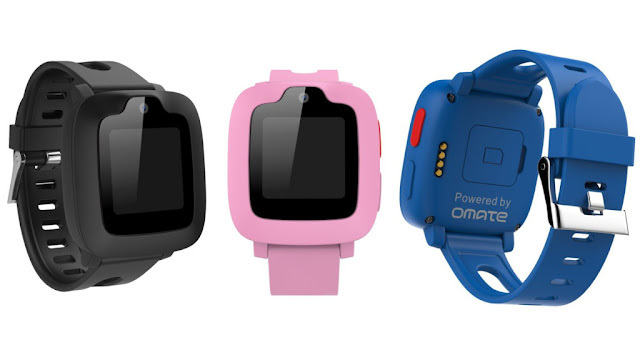 In July 2017, Omate released the Wearable in the US for 149 US dollars (140 euros).